Inder Loves Folk Art: Gaptoothed Creeper. 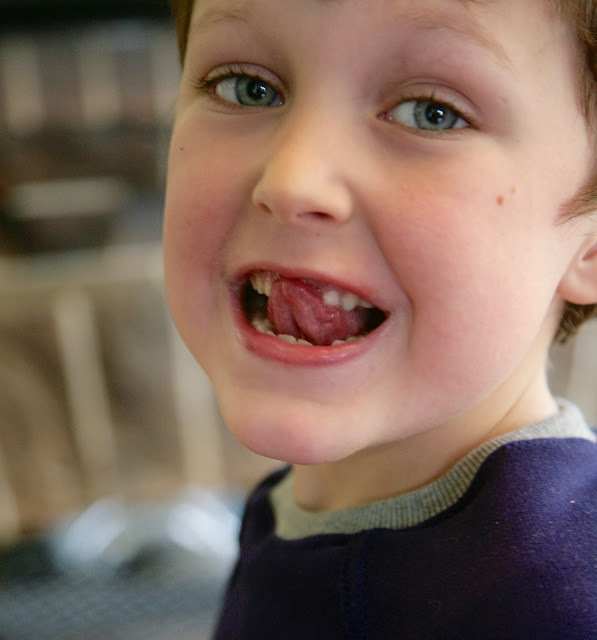 Over the space of two weeks, Joe lost both his front teeth. He's not a fan of this whole teeth falling out business. He thinks tooth fairy money is poor consolation and would rather just keep his teeth, thank you very much. Even though we felt so bad for him we gave him $10 for each front tooth! The only thing worse than the teeth falling out is the part where they are loose, so at least we're past that with the front two. You should've seen this poor child trying to maneuver a grilled cheese sandwich past his wiggly front teeth. It was a hard couple of weeks! But he does find it mildly amusing that he can slip a whole Cheerio through his front gap now. Anyway, yesterday I had a sewing buddy over and she recently got a serger and is learning to sew with knits. She brought a bunch of this navy ponte knit she picked up at Joanns. She had originally planned to sew leggings for her daughter with it, but I told her it wasn't stretchy enough for that and gave her some rainbow chevron cotton lycra to make leggings with instead, as well as a beginning serger lesson. In exchange, she let me take enough blue knit to make a Field Trip Raglan sweatshirt for Joe (she still has tons left to make a sweatshirt for her daughter!). 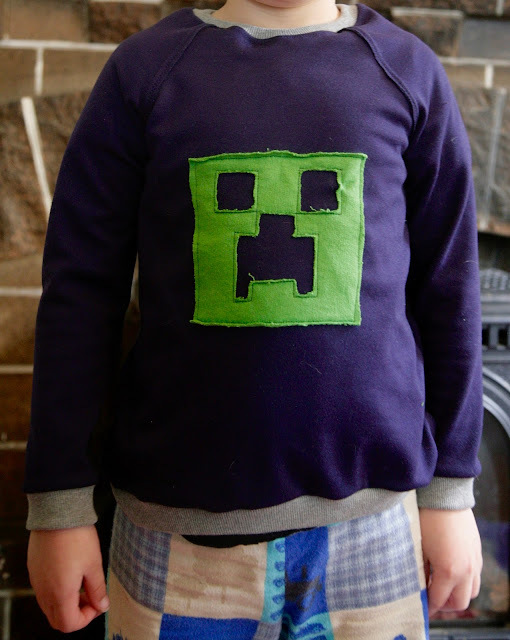 So I whipped up this quick and dirty "Creeper" sweatshirt for Joe. 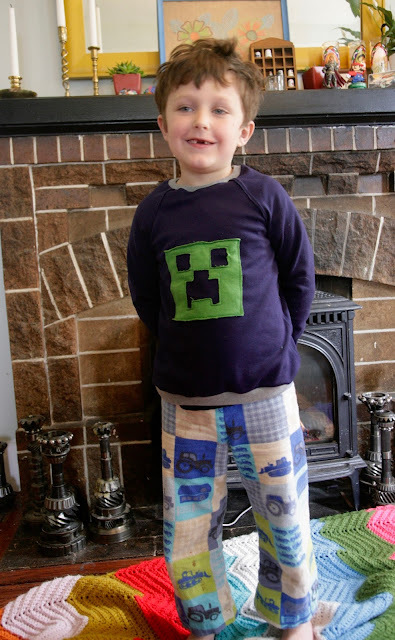 Like many six year olds, Joe is currently obsessed with Minecraft, and I just happened to have some apple green french terry hanging around for an applique. To make the Creeper face, I cut out and sewed on the square of green first. Then I traced the face on tissue paper and pinned it over the fabric, and sewed the details through the tissue paper and two layers of fabric underneath. Then I tore the tissue paper off and snipped away only the green layer to make the face. So it's a bit of applique and reverse applique in the same shirt! I did exposed raw seams on the raglan, mostly because I didn't want to change my serger thread for this project in between two nicer and matchy projects. For the same reason, the neckline and waistband aren't as nice as they could be, because I did them on my sewing machine (no walking foot) instead of the serger. Sometimes I feel really lazy about a project, and later I look back and think, "would it have been that big a deal to do it right?" But I think I have to do that occasionally, to remind myself that doing it right is worth the little bit of extra effort for most projects. And I still like whipping up a quick item now and then and don't mind if it's obviously homemade. Sometimes I neglect to blog my "quick and dirty" makes, because they don't seem nice enough to share. But they are often the most popular things I make for the kids! Neither the kids nor I view them as precious or not-to-be-worn. And in this case, Joe is a seriously happy customer! He said the sweatshirt feels nice and warm and hasn't taken it off since. 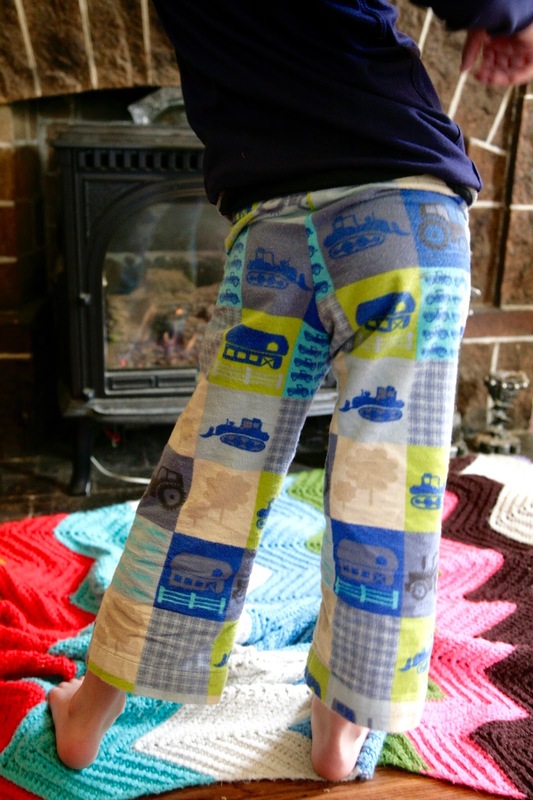 Speaking of quick and dirty makes, I made these pajama pants for Joe last year, when he still wasn't wearing pants, even PJ pants, and they sat in his bin unworn for a long time. With the chilly weather and return of the long trousers this year, Joe has taken a belated liking to these and wears them any chance he can now! He's discovered the joy of flannel pajama pants! Again, not my finest work as a seamstress (check out my total disregard for the concept of pattern matching!) and nothing fancy, but a regular favorite. Joe doesn't seem to mind that they are "floods"! What does the toothfairy leave in your household? Oh M!!! For some reason, although he's a firm believer in Santa, Joe knew from the beginning that the tooth fairy wasn't "real." In a way this is a relief! We play along, but you can tell he's not super impressed. He feels the same way about the money too, like "meh, I guess I'll take your $10, but I'd rather just keep my teeth in my mouth." He's very nonplussed by the whole business! Oh my gosh, how hilarious! We have not lost any teeth at our house yet, but I have had the same internal debate about the tooth fairy and inflation. When i was growing up the tooth fairy brought us a silver dollar. My mother would tell us that stores wouldn't accept the silver one so we'd happily trade for a paper dollar. It was only years later that I realized that all five of us were getting that very same silver dollar under our pillow. So funny! Anyway, I'd call both garments a win and I'm glad you posted it. Honestly I wouldn't have noticed any wavy seams if you hadn't called them out - all I could see was how happy Joe was to be wearing that sweatshirt! And I love that second photo of him! He is a handsome one. I remember being excited about the tooth fairy and excited to spend my money, so it's funny to me that with Joe, it's less of an exciting tradition and more of a consolation prize for the unpleasant business of losing your teeth. He shrugs at the money, too, like, yeah, I guess it's nice that you're trying to make me feel better, but I just want my teeth back! For him, it's not an exciting rite of childhood, it's just a bloody yucky unpleasant mess! Hahaha!! Tooth fairy brings 50c here, unless he/she is really slack and misses a few days then he/she may guilt cough up a $1. Aww, the missing front teeth is so darn adorable!!! Jude was a bit like Joe here - he would never pull his teeth. He has actually swallowed a couple of teeth while eating (not at the same time!) because they were THAT LOOSE but he wouldn't let us touch them - nor would he wiggle them! We do $1 but we put glitter glue on it to make it fancy. $5 for the first tooth. Awww, he looks so cute with his missing front teeth! I can understand him not being too thrilled to lose them, though. 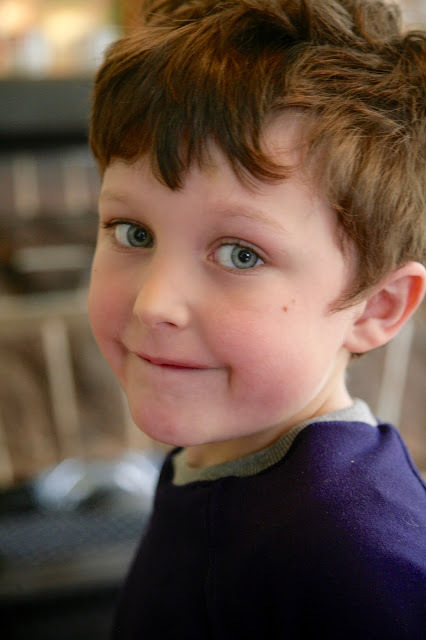 When I first told Luke, my oldest, that his teeth were going to fall out he was horrified! So far he hasn't had any come out but I was sort of wondering what the going rate was for teeth. I think I got a dollar in the late seventies when I started losing teeth so I can see giving quite a bit more now. 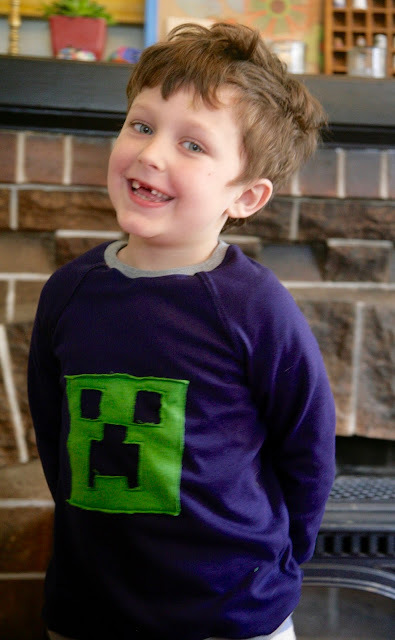 Luke recently asked me if I could download Minecraft for him, but I haven't done it yet. I have no idea what that game is-- he is so obsessed with Angry Birds that maybe it would be good to give him another option. The outfit you made Joe is totally cute. We have a few of those items that were cast off when I initially made them but then become favorites later (when they are too short!) I'll take it, though, because I love seeing them in things I've made.